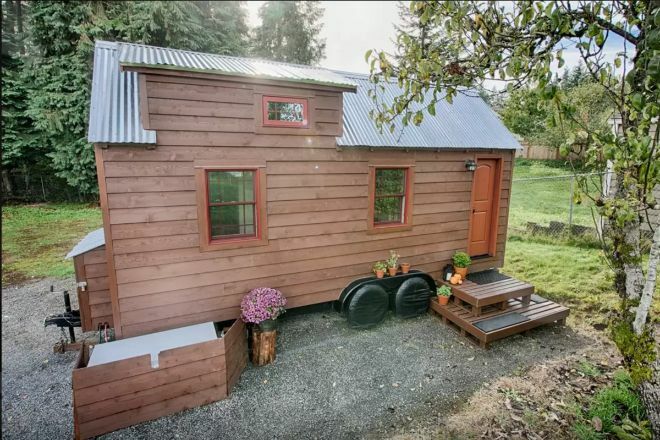 The Tiny Tack House in Everett, Wash., is a wonder in tiny living. 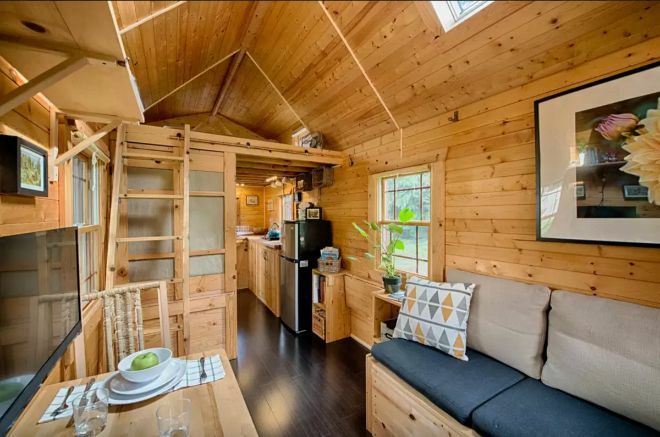 Christopher and Malissa Tack spent seven months in 2011 building the tiny home, according to the Airbnb listing. Since then, they have enjoyed the tiny lifestyle. 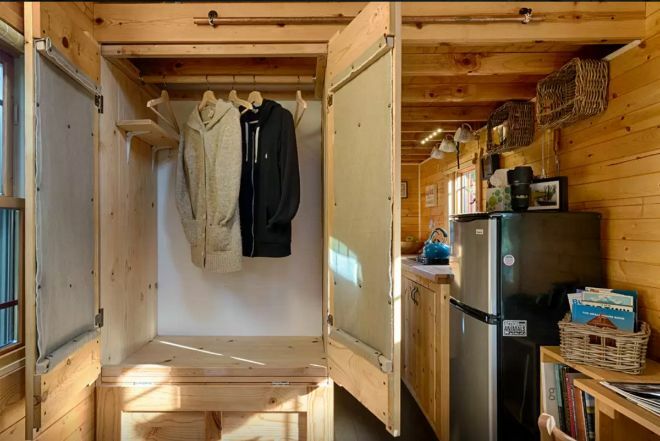 "We are letting people into our home, in hopes to inspire others wanting to make the change to tiny a little easier after staying in one for themselves," Christopher says on Airbnb. 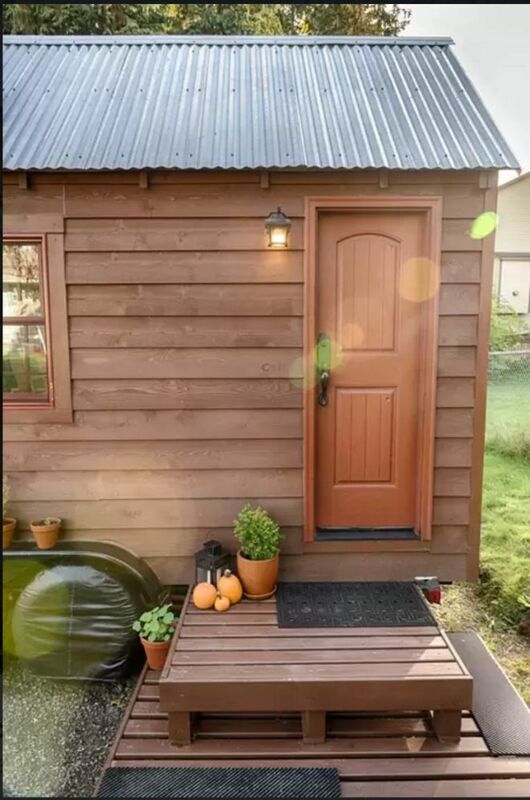 Christopher suggests staying in several tiny homes to decide which style, if any, is right for you. "It's an experience, and one that we are excited to offer to others," he writes on Airbnb. Christopher, a photographer, and Malissa, a 3-D artist, documented their building process on their website and YouTube page. 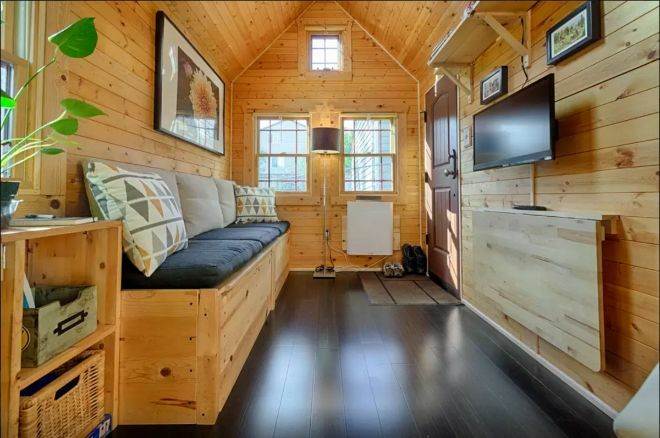 In addition to photographs and detailed information such as plans, Christopher and Malissa have compiled a list of tiny home resources to serve as inspiration and help for those wanting to build their own tiny homes. Highlighted websites include PAD Tiny Houses, the Tiny House Blog, and The Tiny Life, which advocates for the tiny house movement. 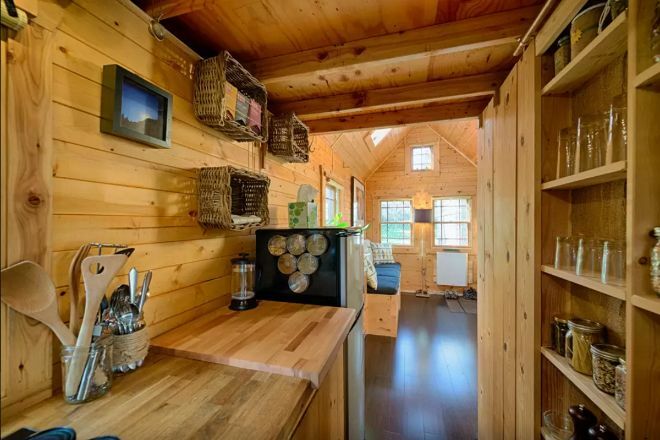 The Tiny Tack House has a long bench and folding desk, both of which are multifunctional. The former is a relaxing area where you can take a nap or read a book, while the latter is perfect as a workspace or dining table. "When you are finished, simply fold the desk down and enjoy your entertainment area," Christopher explains. 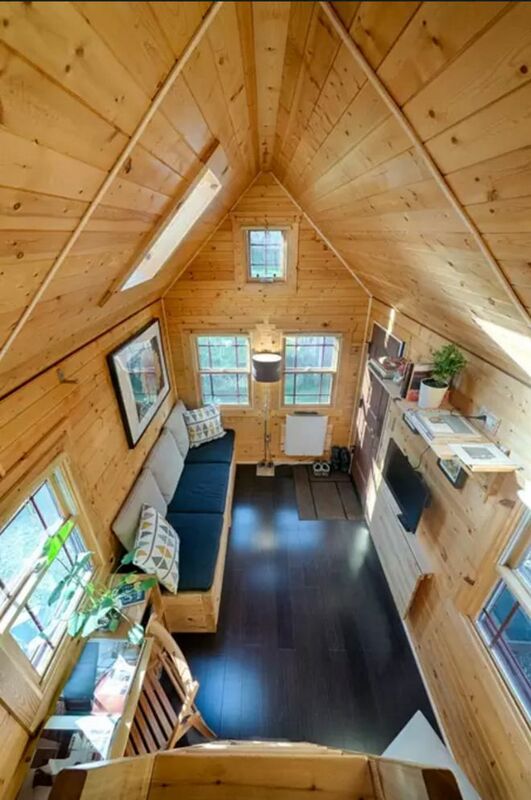 A large closet and ample storage space mean even the most clothes-obsessed dweller won't suffer in this spacious tiny home. 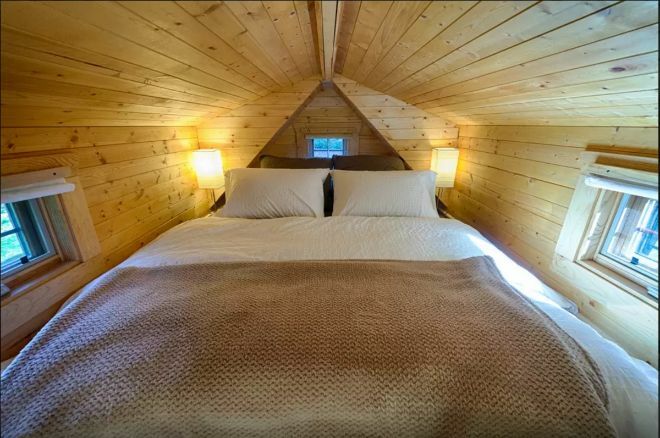 Christopher and Malissa built a lofted sleeping space complete with a queen-size, memory foam mattress for a taste of luxury. "It will leave you feeling just too cozy to get out of bed," writes Christopher. With 12 windows, sunlight streams in and illuminates the home's interior during the day. Visitors can enjoy gorgeous views of lush evergreen trees, iconic to Washington state. Christopher and Malissa encourage their guests to explore the surrounding areas, which include an animal farm, picnic shelter, trail access, and several sports facilities including a basketball court, horseshoes, street hockey, a pool, a tennis court and water playground. 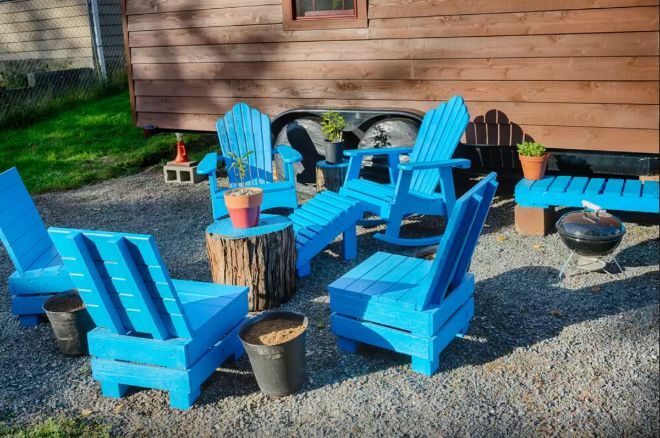 Located just one hour north of the Tiny Tack House on Fidalgo Island, the Hope Cottage is a tiny house surrounded by the natural beauty of farms, mountains, rivers and wildlife. 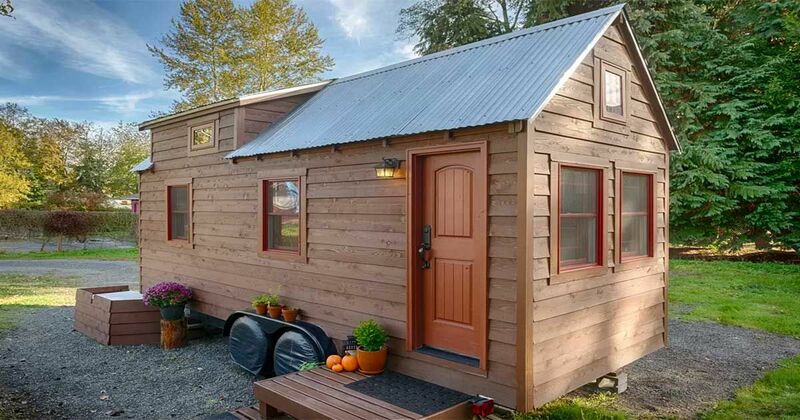 Being among such big nature can be a humbling experience, and a tiny house is perhaps the best way to experience these great American landscapes. 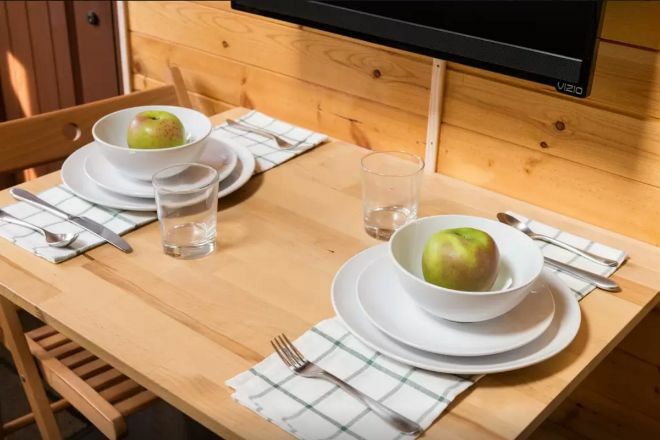 Like the Tiny Tack House, the Hope Cottage is a fully functioning home with Wi-Fi, a big-screen monitor and stereo sound system, as well as a kitchen with a microwave and refrigerator, plus a bathroom featuring a flushing toilet and shower. 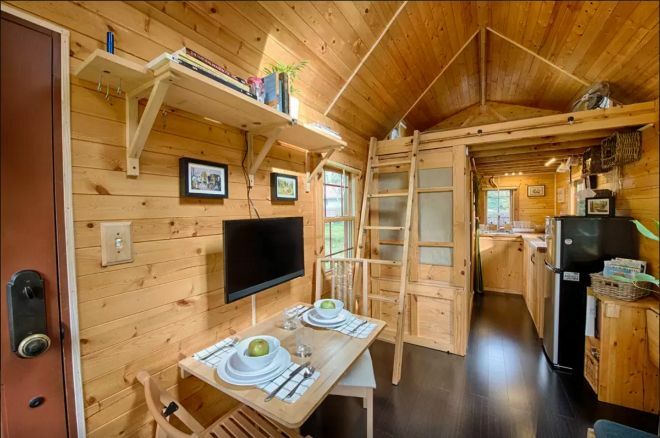 But what makes this tiny home "the Cadillac of (tiny homes)," as their website claims, is a two-person far-infrared sauna. 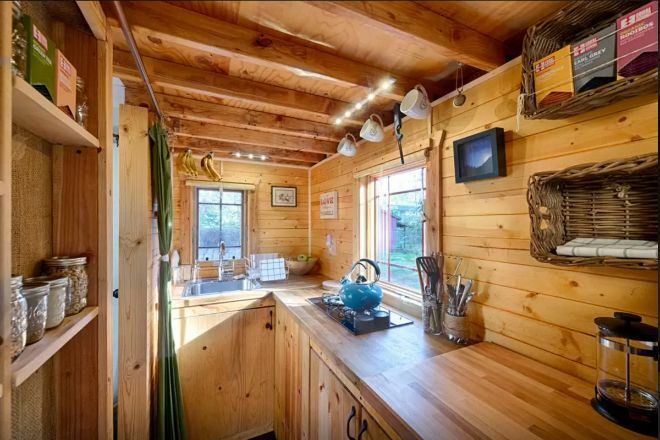 Hope Cottage was amazingly built on an 8 1/2-by-20-foot trailer, and features a double Dutch door, stairway up to a sleeping loft, and a gorgeous skylight. "It's like sleeping under the stars!" says the Hope Cottage website. 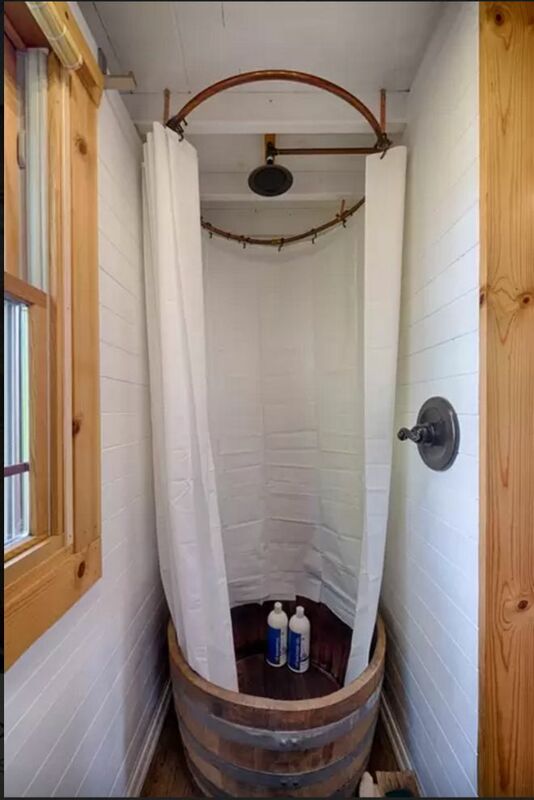 The bathroom is fitted with a wine barrel shower and a composting toilet. 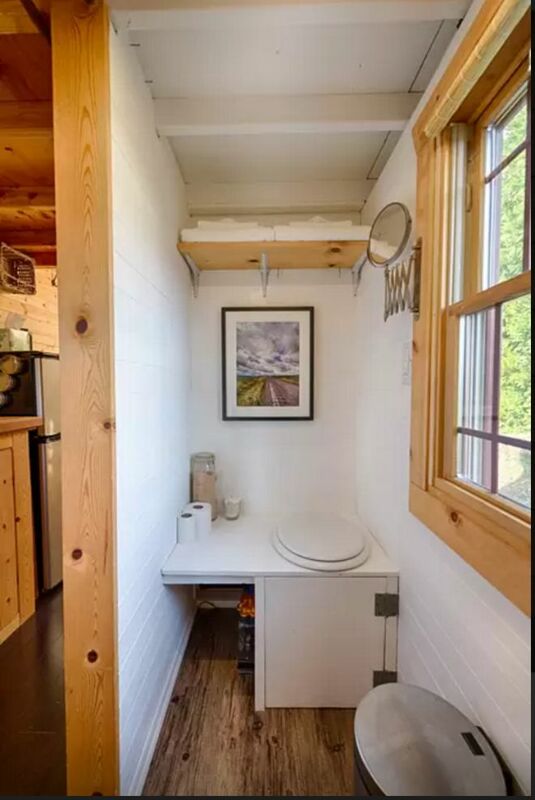 However, for guests uncomfortable using what Christopher clarifies is essentially a bucket, the main home with a typical shower and flushing toilet are available at all times. 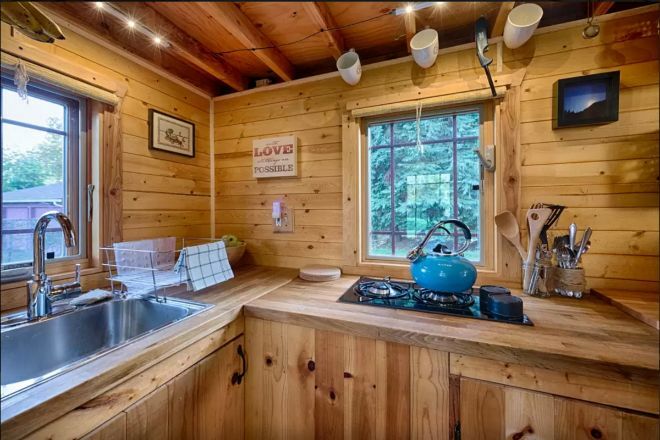 The kitchen is fully functional with a small sink, two-burner cooktop, and a compact refrigerator. 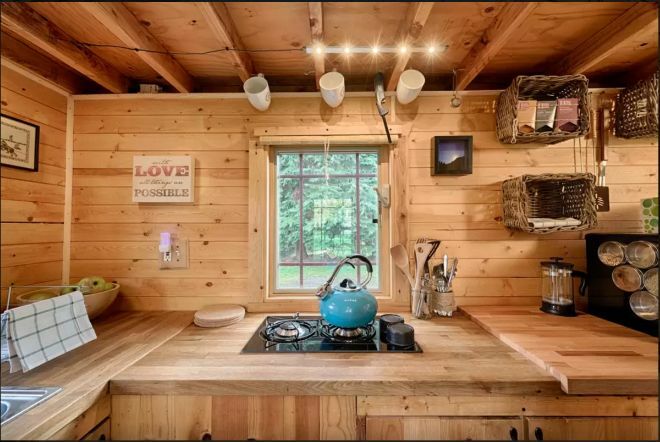 Other amenities include a French press, utensils and cookware, a TV with Internet, heaters, a mini fan, and outside grill with a star-gazing sitting area. "Feels like a little fantasy place, and offers a little inspiration!" the website reads.